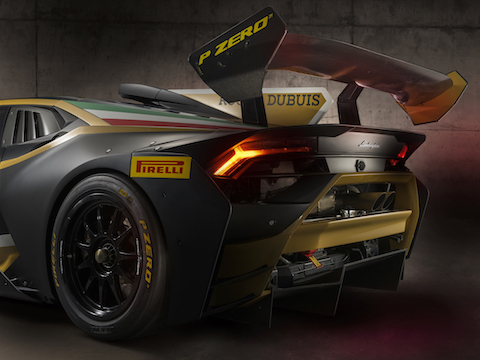 Lamborghini Squadra Corse presents the Huracán Super Trofeo Evo Collector 2019, a special edition of the racing car that competes in the Lamborghini single-brand championships. The new Collector was unveiled during an event held at the Roger Dubuis Manufacture in Geneva, headquarters of the prestigious watchmaker that has been a Lamborghini Squadra Corse partner since 2017. 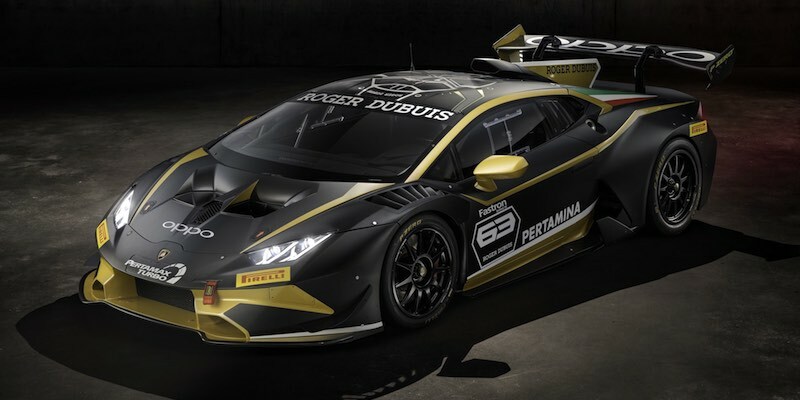 The car features a new black and gold livery designed by Lamborghini Centro Stile, with body in matte black carbon fiber, embellished with gold details on the front bumper, hood, sides, diffusor, and rear fin, to highlight the extreme aerodynamics of the Huracán Super Trofeo Evo. The roof features graphics that depict the movement of the Excalibur Huracán Performante: this is the latest timepiece tribute by Roger Dubuis to Lamborghini cars, following the iconic Excalibur Aventador S.
The stylistic elements of the watch’s movement evoke certain components of the 630 CV V10 engine in both the road legal Huracán and Super Trofeo versions. The watch’s “X” design encloses the movement exactly like the X Frame that protects the car’s engine. The case back of this new timepiece, produced in only 88 specimens, stylizes the dynamic design of the car’s wheel rims, just as the watch crown is inspired by the single nut from the rim of the super sports car. The partnership between Lamborghini Squadra Corse and Roger Dubuis was initiated in 2017 based on shared values, such as the search for perfection in the field of mechanics; continuous innovation; and the unique design and artisan craftsmanship found in each company’s products. The synergies between the two brands also extend to exclusive experiences designed to engage customers, bringing them closer to two worlds that are seemingly distant but whose very nature is passion: the passion for speed and the passion for fine watchmaking.